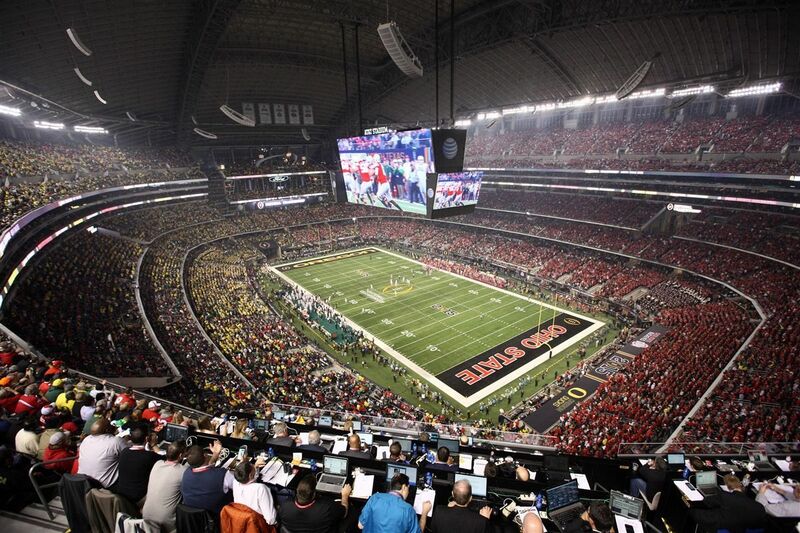 Last Monday, on Jan. 12, the Oregon Ducks and the Ohio State Buckeyes squared off in the inaugural College Football Playoff National Championship. If you happened to be flipping through the channels and stumbled across it, you wouldn’t think it was a bunch of 18 to 21 year-olds. The presentation, the pageantry and the international attention that these student-athletes receive are incomparable to anything we have here in Canada. While there has been scrutiny of these big universities for the financial benefits that they get out of their unpaid athletes, the hype around college sports doesn’t depend solely on money. If you did happen to catch the Buckeyes dismantle the Ducks 42-20, you weren’t alone. According to ESPN, over 33 million people tuned into the championship tilt. If that seems like an overwhelming amount, it’s because it is. Last year’s Stanley Cup Game 5, where the Los Angeles Kings defeated the New York Rangers to hoist the cup, brought in approximately six million viewers according to Sports Media Watch. The National Championship even squashed the 27.8 million viewers who saw the San Francisco Giants’ final out in the 2014 World Series, according to Forbes magazine. And, for the sake of comparing apples to apples, 320,000 people watched this year’s Vanier Cup on Sportsnet between the Montreal Carabins and the McMaster Marauders, reported Canadian Interuniversity Sport (CIS). Although baseball is traditionally known as America’s pastime, football has become an entirely different beast within the past two decades. On American campuses, Saturdays are known as gameday. Whether you are a sports fan or not, students pack their stadiums to bask in their school spirit. It’s not so much a game, but a social event. Most students who attend American universities are only there for four years and it seems that they sure know how to make the most of it. Signs are made, faces are painted and the marching bands are rowdy; it’s a party that every student is invited to. It’s unfair to compare Canada’s football passion to America’s, but hockey is supposed to be our game. Yet, when it comes to supporting our varsity teams, the enthusiasm just isn’t there. According to CIS, the average attendance for the past three home games of Concordia’s men’s hockey team was 53 spectators. Canadian universities will never draw the same attraction towards athletics as the juggernaut American institutions. Their funding and population are too vast, but the passion that their student body brings is something that can be admired. We may not have the television deals or national coverage, but a little more support for the maroon and gold could go a long way.